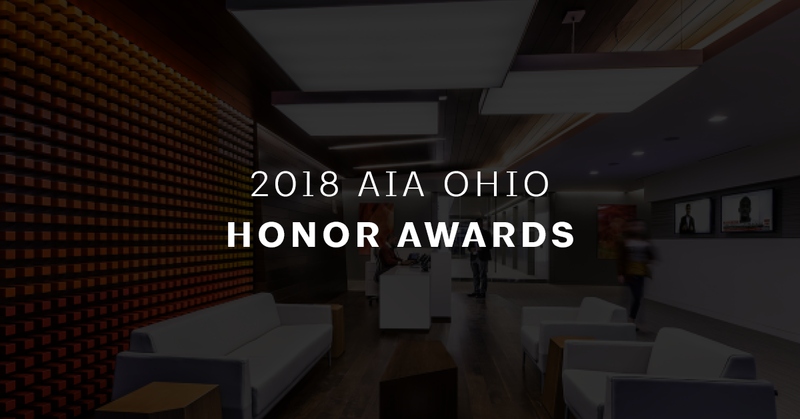 Congratulations to the AIA Ohio 2018 Honor Award recipients. These awardees will be recognized at the 2018 AIA Ohio Conference in Toledo, October 4-6, 2018. The Gold Medal is the highest honor that AIA Ohio can bestow on a member. The AIA Ohio Board of Directors confers this award, which recognizes the exemplary contributions and significant accomplishments of AIA Ohio members. Read Bruce’s entire submission, including details of past roles, assistance in grassroots campaigns and endorsements from several key colleagues serving AIA for the betterment of our industry. The AIA Ohio Gold Medal Firm Award is the highest honor AIA Ohio can bestow on an architectural firm. The AIA Ohio Board of Directors confers this award, which recognizes the exemplary contributions and significant accomplishments of firms lead by AIA Ohio members. This award recognizes a firm’s ongoing commitment to a focus on design excellence, innovation in practice and design, or the advancement of firm culture, each of which contribute to the firm’s unique place as a leader in the profession. This year, AIA Ohio recognizes City Architecture with the Gold Medal Firm Award for 2018. City Architecture was founded in 1989 by Paul Volpe, Mark Dodds and Dominick Durante with a vision of creating high quality architecture in established neighborhoods and the urban core. In 2014 ownership of the firm was transferred to three senior principals – August Fluker, John Wagner and Alex Pesta all of whom are registered architects and AIA members. The impact this exemplary organization has made and continues to make on the skylines in and around the Cleveland area is immeasurable. City Architecture has amassed countless awards over the years and established itself as an innovative housing design firm for both market rate and affordable projects. Take a moment to view their complete submission and notable portfolio. The AIA Ohio Mentor Award recognizes a member who has demonstrated strong leadership, guidance and service in the support of mentorship to fellow professionals or in her/his community. Awarded by the AIA Ohio Board of Directors, this award recognizes the exemplary contributions and significant accomplishments an individual has made to the profession via mentorship. In addition to Sara’s influence on the local level, she has expanded her sphere of influence at the national level through her participation on the AIA’s National Practice Management Knowledge Committee Advisory Board. Review Sara’s recommendations and submission. The AIA Ohio Public Service Award recognizes a member who has made a significant impact in his/her community, as well as to the profession, through public service. AIA Ohio is proud to announce Terry Welker, FAIA as the 2018 Public Service Award recipient. Terry has been the Chief Building Official for the City of Kettering since 2000. He believes that in order to change the world we can’t just be physical modifiers, we also have to be social modifiers and become teachers. Terry’s public service ranges from industry impact through AIA leadership, lectures, juries, and arts advocacy. Join the AIA Ohio Board in thanking Terry for his significant contribution to his community. Congratulations to our 2018 AIA Ohio Honor Award recipients.